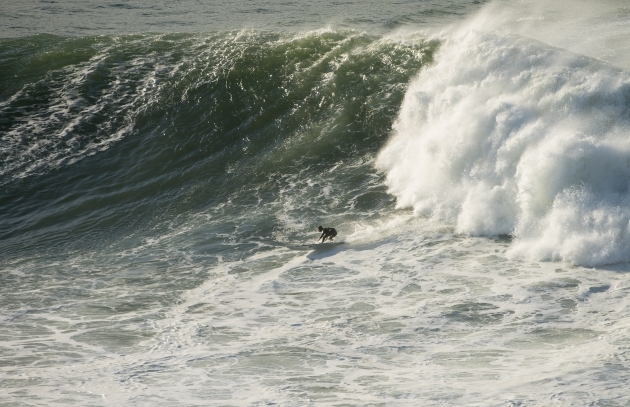 Punta Galea, Spain (Sunday, December 22, 2013) – A spectacular day of surfing on the Xpreshon Big Wave World Tour saw South Africa’s Grant “Twiggy” Baker take the win at the Arnette Punta Galea Challenge in Basque Country, Spain on Sunday. The large Atlantic Ocean swell pumped consistent big waves into the Punta Galea Harbour point with surfers agreeing that wave faces were in the 30 feet range all day. 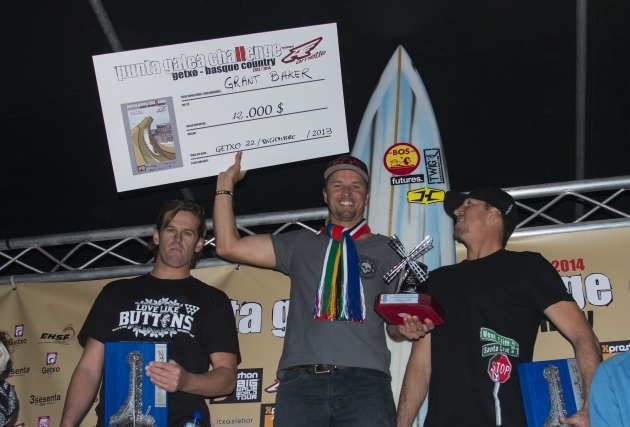 Baker, 40 years of age and from Durban in South Africa, controlled the 45 minute final from start to finish utilising perfect positioning and taking the biggest and best waves to finish with a near perfect score of 29.01 out of a possible 30. Today’s win sees Baker leading the Xpreshon Big Wave World Tour rankings for this season and well positioned to win this year’s Big Wave World Tour Title. Finishing second and third and not far behind Baker were USA/Santa Cruz pair Nic Lamb, 2nd place on a final tally of 28.21, and Ken Collins on 24.87 in 3rd. “I would have love to have won today and I think it got down to Baker’s last wave where he was in a slightly better position than myself to catch that wave” said 25-year-old Lamb. Punta Galea offered an amazing spectacle for the large crowds, estimated above 10 000, who lined the picturesque 400 meter cliff face that overlooks the break in an amazing natural auditorium setting. Local Basque surfer Adur Letamendia from nearby Zarautz was the highest placed European making the final and placing 4th ahead of Ramon Navarro from Chile and David Bustamante (Basque/Spain). Australian waterman Jamie Mitchell placed 7th overall, narrowly missing the final when he was edged out in his Semi-final by Navarro. The water safety team were kept extremely busy all day with numerous snapped leashes and a particularly dangerous inside rocky section to the break where many surfers had to be towed from. One such incident saw rider and ski come to grief on the rocky point. Apart from that, the day was managed superbly by competitors and organisers. Three event locations remain on the Xpreshon Big Wave World Tour, Mavericks in California, Nelscott Reef in Oregon and Todos Santos (Mexico) with a waiting period through to March 31st. The events only run if and when a large swell and good surface conditions coincide with surfers given a few days notice to get to the location and surf. The biggest waves in the world deserve the biggest screen in your house. With XPRESHON you could be watching the XPRESHON Big Wave World Tour live on your TV. But whatever your style – skate, surf, snow, BMX or Moto – only XPRESHON has it all – All the news, All the latest movies and live events from all around the world. Miss Nothing with XPRESHON! Exclusively on XBOX and Windows 8. Spectacular three to four metre waves at Pipeline in Hawaii provided the platform for an historic final day to the 2013 ASP World Championship Tour (WCT) season as Mick Fanning (AUS) was crowned the ASP World Surfing Champion for the third time, Kelly Slater (USA) won his seventh Billabong Pipe Masters in Memory of Andy Irons title and John John Florence (HAW) clinched his second Vans Triple Crown of Surfing award earlier today. Needing to reach the semi-finals of the yearend event to secure the World Title or risk having Slater, 41, overtake him by winning the event, Fanning, 32, produced two nail-biting, last minute, come-from-behind heat victories in Round 5 and the quarter-finals to secure the crown before Slater even took to the surf on the final day. Fanning joins surfing legends Tom Curren (USA) and Andy Irons (HAW) as a three-time world champion, a record surpassed only by Australian Mark Richards (4) and Slater with 11 titles. Slater did everything expected of his charge for an unprecedented 12th World Title today, leaving 2012 Triple Crown Champion, Sebastian Zietz (HAW), and 2012 World Champion and defending Pipe Masters champion, Joel Parkinson (AUS), needing to replace both their counting scores in his quarter- and semi-final match-ups respectively. Slater went on to defeat Florence, 21, in a hard-fought, 35-minute Final that ended with less than half-a-point separating the two. With the biggest crowds ever witnessed packing the beach at Pipeline, and the gravitas of Slater’s 56th elite tour victory apparent, the greatest athlete the sport has ever produced was emotional on the final day of 2013. Speculation surrounding Slater’s eventual departure from the ‘Sport of Hawaiian Kings’ has been present at the season-ending event for the past several years, often supported by questions regarding motivation, legacy and physicality. The iconic American addressed these rumours unprompted today while on stage collecting his seventh Billabong Pipe Masters trophy. 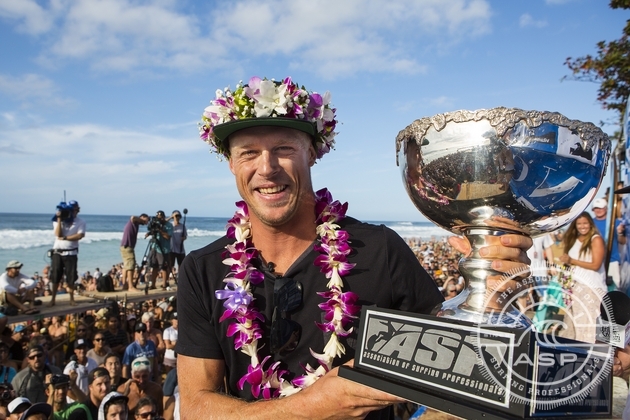 Today marked John John Florence’s second Vans Triple Crown Title in three years, but his runner-up finish in the final event forces him to hang on to his life-long dream of one day hoisting the Pipe Masters trophy. The youngster, who lives right at Pipe, battled Slater with a series of exciting exchanges during the final 10 minutes, coming painfully close. South Africa’s Jordy Smith, who missed the final event of the year due to an injury to his big-toe suffered at the penultimate event in Portugal in October, finished 2013 ranked No 4 on the ASP World Championship Tour (WCT) rankings, up eight places from his 2012 ranking. 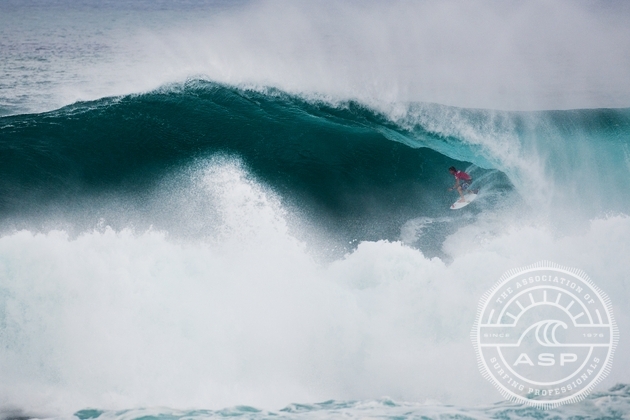 Compatriot Travis Logie, who placed 25th at Pipeline, ended the year ranked No. 25 and will join the world’s top 34 ranked surfers on the 2014 ASP WCT thanks to his top 10 finish in the ASP Qualifying Series rankings. The top 32 on the rankings plus two ASP wildcards for next year will be announced tomorrow. South Africa’s Beyrick de Vries, who yesterday stunned the surfing world when he posted a perfect 10 point ride on what has been described as the ‘biggest and best biggest barrel in the storied 50 year history of surfing competition at Sunset Beach’ in Hawaii, followed that up earlier today by winning his Round of 64 heat in the Vans World Cup of Surfing and moving into the last 32 in the final ASP Prime rated event of the 2013 season. What makes these feats truly remarkable is that De Vries, who turns 21 in a fortnight, is competing in his first event at Sunset Beach, notorious for its huge ‘playing field’ which makes wave selection difficult even for those that live there and ride the spot every time it breaks. Competing in waves that reached 20 foot (six metres) on the face, de Vries showed supreme skills in manoeuvring his way into, and out of, a massive tube yesterday. Today, in just his third heat at the break, he caught and rode the best waves in his 30 minute encounter to defeat local standout Olamana Eleogram (HAW) as the pair eliminated 2000 ASP World Champion and former Sunset Beach winner CJ Hobgood (USA) along with current No. 18 on the World Rankings, Jadsen Andre (BRA). Interviewed after today’s heat victory the Umhlanga resident humbly professed that he didn’t know how he was doing so well and that he was just having fun before going on to say that he was proud to be representing South Africa and thanking his board caddy Jake Patterson (AUS), all his friends back in SA and the water-patrol who were a great confidence booster, particularly in the giant surf yesterday. When competition resumes De Vries will be up against CJ Hobgood’s twin brother (USA), New Zealand’s Ricardo Christie and current ASP WCT No. 5 Taj Burrow (AUS) with the top two progressing to the last 16, which would match the Umhlanga resident’s best result in a Prime rated event. Coming into this event ranked No. 50 on the ASP World Tour rankings, De Vries needs to progress through three more heats to reach the final here to give himself a chance of qualifying for the 2014 ASP World Championship Tour which features the world’s top 34 ranked surfers. Dale Staples (St Francis Bay), who was one of the top performers during last week’s Reef Hawaiian Pro at Haleiwa where he finished equal 17th overall, was eliminated in the Round of 96 at Sunset yesterday. Current ASP WCT No. 23 Travis Logie (Durban), the only other South African in the event, was ousted when he placed fourth in his tightly contested, low scoring Round of 64 heat today. The Vans World Cup of Surfing is likely to be completed later today in smaller one to 1.5 metre waves at Sunset Point. All the action can be followed live at http://www.vanstriplecrownofsurfing.com/vansworldcupofsurfing2013/live starting at approximately 8.30pm South African time.